10 Rittenhouse Square marks the pinnacle of sophisticated city living. Designed by world-renowned architect Robert A. M. Stern, the red brick and limestone building rises 33 stories above its namesake park, offering dramatic views of the skyline from some of the most spectacular homes the city has ever seen. With marble floors, Venetian plaster walls, and regal furnishings, the formal oval entry lobby creates a grand overture to the amenities and residences that lay beyond. Behind the front desk, a white glove concierge waits to greet your guests, accept deliveries and assist you with any request imaginable. 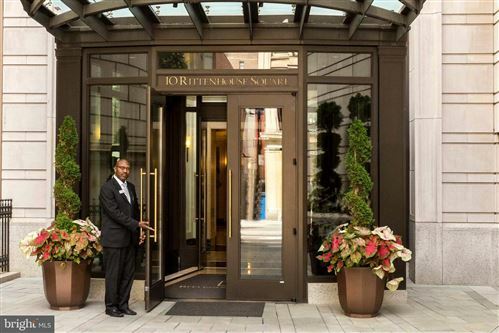 An additional private entrance directly on Rittenhouse Square provides the ultimate in prestige and convenience. Philadelphia’s rich culture and deep history lay just beyond the front door, its finest services within. Each residence is brilliantly designed to offer an artful balance of grace, function and ease. Here, beauty and comfort are evident in each detail, from the generous opulence of the lobby to the lush elegance of its inviting gardens. See all 10 Rittenhouse Square.